The world of medicine can be quite scary. Even when it appears that we have it all figured out, someone surfaces with a terrifying condition or a new disease that tends to baffle even the greatest of doctors. There’s still so many illnesses and diseases that can only be managed and treated to a level that’s considered safe, but never completely cured. We are always learning new things about the human body, and even after studies have been completed, there are times where we end up discovering the answers that we got are actually completely wrong. It seems like while living in a time where anyone can instantly find out anything they want by using the little thing in their pocket, we would all be walking around with bionic parts. However, even in the year 2018, there are so many medical answers we are still searching for. There isn’t any denying that we have come a long way, however. Patients from over 100 years ago unfortunately were not even close to as lucky as we are today when it comes down to receiving the medical answers and care that we need. We literally put our own lives into the hands of doctors on a daily basis, always trusting that they know exactly what they’re doing to keep us safe. As much money and time they’ve put into their education however, they are often still wrong about many things in that world. The only true way to find out if something really works as it should is to test it, humans in this case, we’re often used as guinea pigs in these studies. Perhaps 100 years from now, someone will design an insane list of medical practices, and it’ll start including things that we are doing now that we believe will only improve our health. 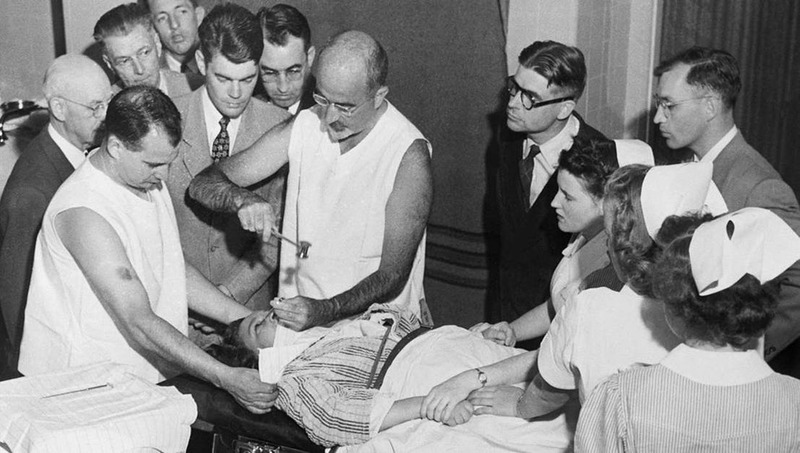 In the meantime though, here are 15 rare and vintage medical photos that we absolutely terrify you. Give us your opinion and let us know which one freaks you out the most! By far, one of the most terrifying medical procedures in the history of everything medicine is lobotomies. Although just a few of these procedures are still done today in only the most extreme cases, nothing will ever compare to the times where doctors truly believed that these treatments were the best and safest solution for anyone who was considered to be mentally ill. The process involved using a sharp ice pick and hammering directly into someone’s eye, and basically scrambling the front part of the brain which was mostly responsible for someone’s personality. The result was always more horrific than the actual procedure could have ever been. The patients would usually wind up in a zombie state, where they’d only end up being able to understand things the same way a child could. And while some of the patients actually wound up seeing some of the symptoms of their insanity disappear, all of their personality traits were often also cleared from their mind during the process as well. What’s even worse is that some of the patients ended up coming out even more insane than they actually were before going under a lobotomy procedure. And not everyone who had a lobotomy done to them was even mentally ill, many lobotomies were performed on people like homosexuals and strong-willed women, simply because they were considered different from the norm.